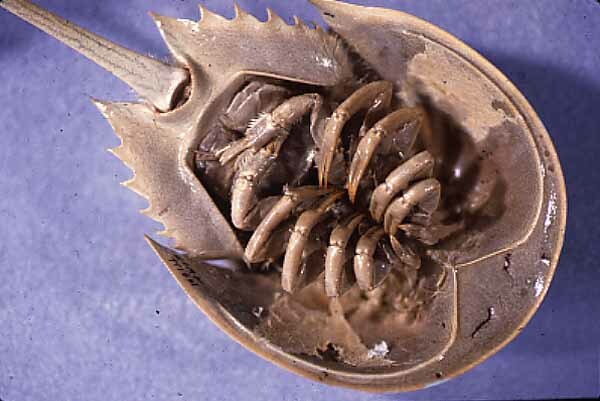 Unlike all other living chelicerates, horseshoe crabs have compound eyes. However, the eyes appear smooth because the many subunits of the eyes, or ommatidia, are covered by a single thick cornea. There are also two simple eyes, or ocelli, in the center of the head. Like all chelicerates, Xiphosurans have a body divided into two main subdivisions, the prosoma ("head") and opisthosoma. Six pairs of legs are present on the prosoma (seven in a few fossil species). These legs bear claws except for the last pair. The appendages on the opisthosoma are modified into a series of overlapping plates that are used as gills for respiration. Behind the opisthosoma is a telson, which is elongated into a long spine, and which gives the group its name (xiphos is Greek for "sword," and uros is Greek for "tail"). 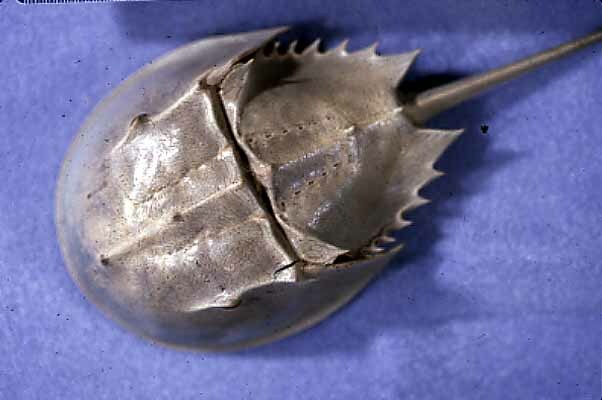 Horseshoe Crabs : On the left, a ventral (underside) view of a modern horseshoe crab Limulus polyphemus, showing the many legs and gills. On the right, a dorsal (back) view, distinctly showing the two body divisions and the telson. Notice that each of the two body sections is expanded outward, providing a protective armor which shields the legs and gills. Xiphosurans have existed since the Silurian with relatively little morphological change. The main trends in the evolution of the xiphosurans have been an overall increase in size, a loss of segmentation on the opisthosoma, and a restriction to marine habitats. Whereas all living xiphosurans are marine, it seems that some late Paleozoic and Mesozoic forms inhabited brackish or even fresh water. Below at right, is a picture of Palaeolimulus, a Paleozoic xiphosuran from Mazon Creek, Illinois, USA. The Xiphosura are not a diverse group in the oceans of today. One species, Limulus polyphemus (shown above), lives along the Atlantic and Gulf coasts of the United States. Three other species in the genera Tachypleus and Carcinoscorpio are found in southern and eastern Asian waters, from Japan to Indonesia and India. Living horseshoe crabs feed on molluscs, worms, and other tasty and nutritious marine invertebrates. Normally living at depths of about 100 feet, they move into shallow water to spawn and lay eggs in beach sand. At mating season they may be abundant on beaches. In the past, horseshoe crabs have been harvested in large numbers for fertilizer and for biomedical research. No living species of horseshoe crab is endangered yet, but harvesting and habitat destruction have reduced their numbers at some locations and caused some concern for these animals' future. 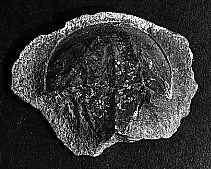 Compare the pictures at the top of this page, of a living horseshoe crab, with these images of the 300 million-year-old Euproops danae, from the Mazon Creek deposits of Illinois. Euproops and many other fine fossils can be seen at the Illinois State Museum. Photos of Limulus taken by B. R. Speer; image of Palaeolimulus by B. M. Waggoner.